You’ve written a series of useful blog posts and done everything you’ve told to optimize that content for your most important keyword phrases. Now it’s time to post it to your social media profiles and sit back and enjoy the rush of traffic. Several years ago this scenario may have been true, but today content marketing has become so competitive that you must include significant promotion as a core element of your editorial process. 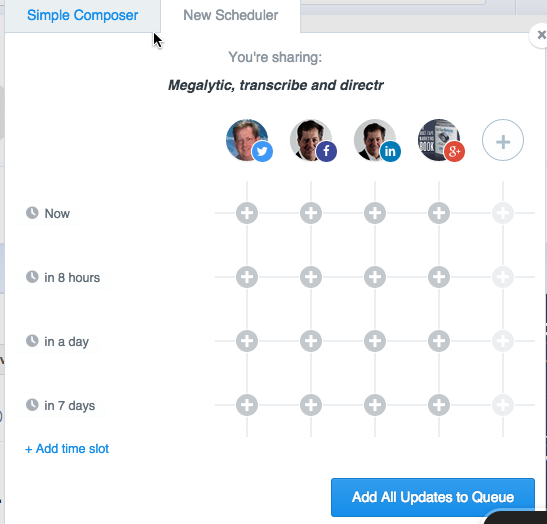 Yes, of course, tweet your blog posts several times (I love using the Buffer Scheduler as you can add a tweet now, in 10 hours, in a day and in a week all at the same time.) Add Facebook, LinkedIn and Google+ posts that highlight why someone might want to read your posts and then go to work on getting your posts in front of other people’s targeted audiences. When we build content plans for our clients today we always include what we call an influencer program that over time can help us significantly increase the reach, traffic, engagement and leads from the content our clients produce. Step one, of course, is to find the Influencers we want to target. By Influencer, we loosely mean other content producers in our chosen industry who we believe to have a following in our ideal client pool. 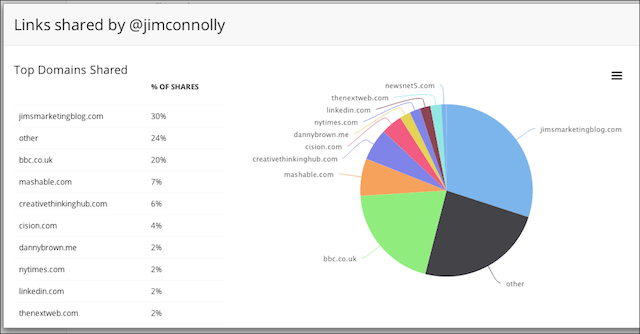 BuzzSumo shows me what kind of content Jim Connely – a small business influencer – shares so I can know what he reads and where he likes to get his information. Next we build a spreadsheet of influencers segmented by our client’s differing market segments or personas. Many businesses seek to gain influence with different levels of stakeholders. For example, a company might need to interact with the CFO and the purchasing agent, and we need to create profiles of influencers for both. This is true as well for businesses that serve significantly different industries of market demographics. We add as much social information as possible to the spreadsheet as well as relevant notes. This process can be automated to some extent using a CRM with unified communications and social built in. Tools like Nimble are very powerful for this purpose. Now that have our list we go to work on building relationships. We never pitch story ideas or ask for links or tweets until we’ve established relationship based on value. One of the first things we do in most cases is to follow every member on our list by putting them in Twitter lists and Google+ Circles. We also subscribe to their blog feed using Feedly, as well as their newsletters and other forms of content. Obviously if you want to build a relationship you must take the time to get to know their content habits, behaviors, and needs. Next we begin the practice of sharing their content with our follower, posting relevant and useful comments on their content and, where appropriate, featuring their content in our own blog posts, emails, and newsletters. In addition to our targeted Influencers, we also build a list of potential guest blog post opportunities. We are looking both for places that we can post and potential writers that may have great content to share on our blog. The reason this is such an important element is that we can often find blogs that won’t respond to covering some topic, but would love a well thought out blog post. In addition, when we add guest posts to the mix of content on our own blog we often find that our content is more diverse and we start to build relationships with bloggers who wish to promote their content featured on our site. Of course, we also vigorously promote our guest posts run on other blogs. 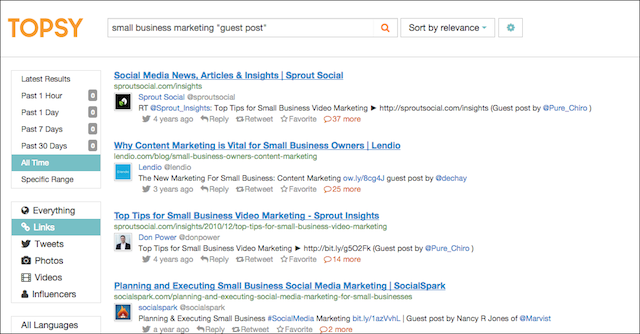 You may find there is some cross over here from your influencer list, but we also use keyword searches on BuzzSumo and Topsy adding the term “guest post” to help build our guest post plan. Searching Topsy to turn up guest post possibilities for my chosen topic. Finally, we look to blow up one or two significant pieces of content every so often. We’ve found that one of the best ways to do this is through collaboration and cobranding. 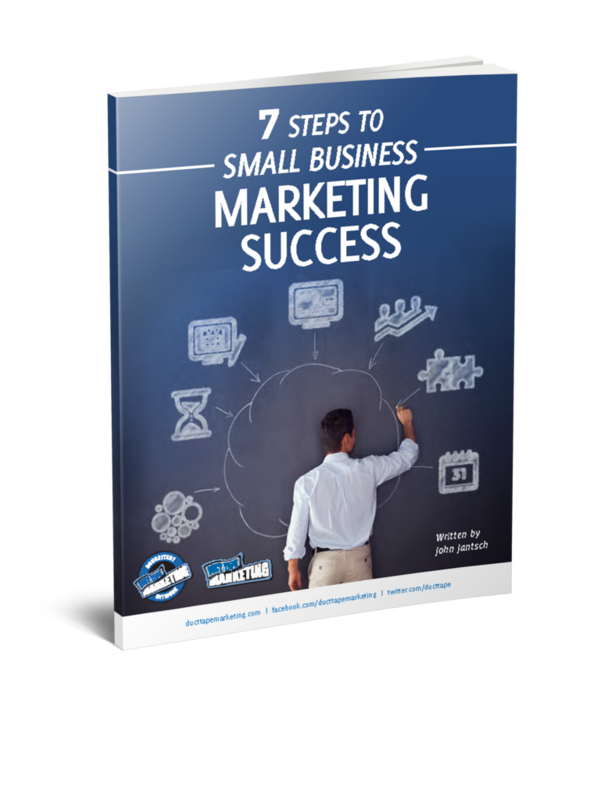 Another approach is to jointly create a long form post, infographic of even eBook with a strategic partner. Quite often one partner may have big data to share while another wants to showcase their killer graphic design skills and collaboration creates an impressive end product that just may get picked up by numerous blogs and influencers as you co-promote with your partner or partners. Yes, content marketing is work, but it is the most effective way to generate leads for any business that wants to compete on expertise and authority rather than price.